Melissa Rogers, BA '88, special assistant to the President and executive director of the White House Office of Faith-Based and Neighborhood Partnerships, and Audrey Rowe, administrator of Food and Nutrition Service (FNS) for the USDA in Washington, D.C., were among the keynote speakers at the annual Together at the Table: Hunger Summit Oct. 24-25 at Baylor. 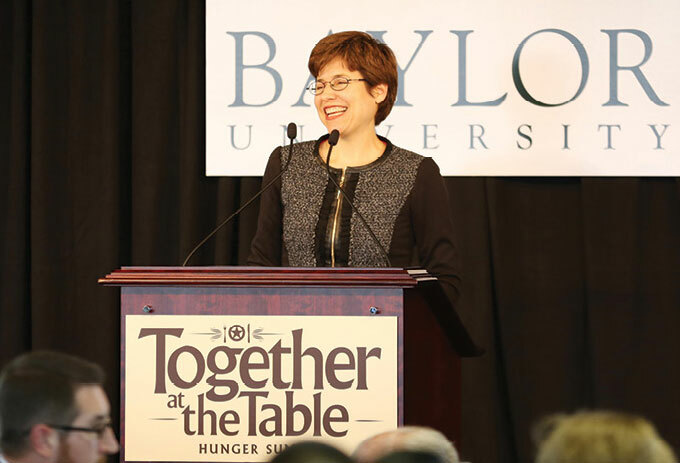 The summit was hosted by the Texas Hunger Initiative (THI), a statewide anti-hunger organization developed within the Baylor School of Social Work, in partnership with the United States Department of Agriculture (USDA). The two-day meeting provided an opportunity for leaders and practitioners from across the country to share their knowledge and expertise about food insecurity and the eventual goal of ending hunger. "What I was most excited about with this year's summit was that we brought an academic community alongside the corporate sector, the faith-based sector and the nonprofit community to look at ways that we could move toward evidence-based models," said Jeremy Everett, director of the Texas Hunger Initiative. "By moving toward evidence-based practices, we know we'll get a higher return on our collective investment in terms of feeding more children and adults across the country in ways that build community and strengthen low-income families' ability to move toward financial independence." Anti-hunger organizations and advocacy groups from around the country chose from more than 40 sessions and panels with more than 70 speakers during the two-day summit. Attendees included representatives from hunger-relief alliances, food banks, school districts, congregations, state departments and academic institutions, among other organizations. For more information about THI, visit baylor.edu/texashunger. Baylor moved up to No. 75 in the latest "Best Colleges" rankings released Sept. 10 by U.S.News &amp; World Report. The latest survey also included good news for Baylor's undergraduate business, entrepreneurship and engineering programs, which again were highly rated by U.S. News. In the latest U.S. News rankings, Baylor at No. 75 is the second-ranked university in the Big 12, behind only the University of Texas at Austin at No. 52. Baylor is the fifth-ranked university in Texas, behind Rice University, UT-Austin, SMU and Texas A&amp;M.
Baylor's engineering program continues to be highly ranked at No. 13 among universities with the "Best Undergraduate Engineering Programs." Baylor's undergraduate business program in the Hankamer School of Business ranked No. 58. Baylor's entrepreneurship program jumped from No. 13 to No. 11. Baylor also came in at No. 52 in the U.S. News High School Counselor Rankings. Baylor University is one of only 22 institutions nationwide to earn an "A" for its high-quality core curriculum, according to a report on the state of general education at the nation's colleges and universities from the American Council of Trustees and Alumni (ACTA). The ACTA study--which can be found at WhatWillTheyLearn.com--looked at curriculum offerings at the major public and private colleges and universities in all 50 states--a total of 1,091 four-year institutions that together enroll more than 7.5 million undergraduates. Institutions are assigned a letter grade ranging from "A" to "F" based on how many of seven core subjects they require. Those subjects are: composition, literature, foreign language at an intermediate level, U.S. government or history, economics, mathematics, and natural or physical science. Baylor--on the "A" list for the fourth consecutive year and one of only 2 percent of all institutions to receive an "A"--requires that students take six of the seven core courses, with the exception of economics. No other Big 12 university and only three other Texas institutions--University of Dallas, Texas A&amp;M University-Corpus Christi and the University of Texas at San Antonio--made the "A" list. The study found that slightly less than 20 percent of American colleges and universities require U.S. government or history, 15 percent require intermediate-level foreign language and only 5 percent require economics. Overall, the average number of subjects required at U.S. higher education institutions is 3.085 out of 7, a "C" grade. A recent nationwide survey conducted for ACTA by Roper Public Affairs and Media found that 70 percent of Americans believe colleges and universities should require that all students take basic classes in core subjects. Baylor's Executive MBA program is ranked No. 98 in the world, according to the Financial Times' 2013 rankings. It also was ranked No. 44 for international course curriculum. "It is such an honor to receive this recognition from Financial Times," said JL Radford-Williard, co-director of the Baylor Executive MBA program in Dallas. "Baylor's Executive MBA program has been consistently ranked by Financial Times since the inception of their EMBA rankings in 2001." The 21-month Dallas and Austin programs are based on a learning environment that enriches the classroom because students learn extensively from their peers as well as Baylor's tenured faculty. For more information, visit baylor.edu/dallasemba or baylor.edu/austinemba. Dr. Corey P. Carbonara, a professor of film and digital media in Baylor's College of Arts and Sciences, is the recipient of the Nat Tiffen Award for outstanding educational contributions to the art and craft of cinematography, awarded Sept. 27 in Los Angeles by the International Cinematographers Guild. Carbonara, director of the Digital Communication Technologies Project at Baylor, was one of four individuals chosen to receive awards. He was the first product manager for Sony of their High Definition Video Systems. After his work at Sony, Carbonara began cinematography and post-production at Baylor. He and his colleague, Dr. Michael Korpi, have worked on numerous Christian documentaries and experimental HD and film tests for digital cinema. In 2000, Texas Monthly distinguished Carbonara as one of the "... Most Powerful Texans in High Tech." He also is a member of the Academy of Digital Television Pioneers. The Baylor Symphony Orchestra has received a Special Judges' Citation for Technical and Musical Excellence in the college division from The American Prize competition. It placed the Baylor Symphony in the top six of all university orchestra submissions. The American Prize is a series of nonprofit competitions designed to recognize and award the best performing artists, ensembles and composers in the U.S. based on submitted recordings. The recording, submitted by Baylor Symphony Conductor Stephen Heyde last spring, showcased the group's 2012-2013 performances of Strauss's "Don Juan," Debussy's "La Mer" and Theofanidis' "Rainbow Body." "I support the goals and mission of The American Prize to bring some recognition to arts organizations in a society that tends to ignore them," Heyde said. For a schedule of Baylor Symphony Orchestra performances, visit the Baylor School of Music webpage. Baylor professor Ray Bagby was awarded The Entrepreneurship Division of Academy of Management's Dedication to Entrepreneurship Award for 2013. Dr. Bagby, holder of The Robert and Louise Rogers Chair of Entrepreneurship in Hankamer School of Business, was honored for his extensive contribution to the entrepreneurship field and teaching over the past 30 years. He has been executive editor of Entrepreneurship Theory and Practice, a top entrepreneurship journal, for more than 25 years. He also has a legacy of great teaching. Bagby has taught students ranging from undergraduates to graduates to executives. Bagby joined Baylor in 1988 and previously served as the director of the John F. Baugh Center for Entrepreneurship in Hankamer School of Business. Dr. Jim Ellor, a professor in the School of Social Work at Baylor, and Dr. Sara Dolan, an associate professor of psychology and neuroscience in Baylor's College of Arts and Sciences, received a major state award, the 2013 Jack Colley Citizen Corps Leadership Award, from the Texas Association of Regional Councils, for their volunteer crisis intervention work in the city of West following the fertilizer plant explosion in April 2013 in which 15 people were killed. Dr. Diana Garland, dean of the School of Social Work at Baylor, said that "Jim and Sara saw a need and responded. They had the wisdom to see that the needs for community response would last long after the initial crisis, and they have continued to serve these neighbors week after week, month after month with compassion and professional competence. They are a picture of what it means to be Christian." Ellor and Dolan, who lead the Central Texas Medical Reserve Corps' psychological intervention team, traveled to West the morning after the explosion and continue to visit weekly. They teach a crisis intervention course for Baylor students and are part of the Federal Emergency Management Agency's Medical Reserve Corps. In October, Baylor announced the establishment of the L-3 Endowed Scholarship Fund in the School of Engineering and Computer Science (ECS), provided by a gift from L-3 Platform Integration. The scholarship represents another step in the meaningful partnership between L-3 and Baylor University ECS. The endowed scholarship proved to be a natural extension of the working relationship between Baylor and L-3 Platform Integration. This partnership includes a number of varied projects, both in and out of the classroom. L-3 recently became the first and primary industry partner within the BRIC, where L-3 engineers at the BRIC work directly with Baylor faculty researchers on collaborations sponsored by the company. Over the last two decades, L-3 has hired more than 40 engineers from Baylor's engineering program.